The term dysmenorrhea refers to menstrual disorders in general (Greek due = difficulty) but it is commonly used to refer to pain in the lower abdomen that precede or accompany menstruation. They usually last from 2 to 3 days. The term algomenorrhea is more exact, the prefix algos meaning “pain”. The menstrual pain affects 50% to 80% of fertile women, by age group. Of these, between 5% and 15% of women are sufficiently inconvenienced to have to modify their daily activities (forced rest, absenteeism from school or work). The menses are often painful to the late teens and in the years before menopause because they are periods of hormonal fluctuations. The pains that occur at these moments of life are generally not worrying and hide no underlying gynecological disorder. In teenage girls, the pain decreases with the years and often disappears after a first pregnancy. When they are very intense and persist after bleeding, these pains can be suggestive of endometriosis. When women menstruate for several years, menstrual cramps intensify or are accompanied by menorrhagia (overabundant menstruation) or unusual intermenstrual bleeding . Seek medical attention promptly if menstrual pain accompanies or has been preceded by fever or abnormal vaginal secretions. In the vast majority of cases, dysmenorrhea has no other consequence than the inconveniences related to pain. When it is especially intense, repeated and not relieved, it can lead to psychological distress and sometimes even depression. However, it is important to treat a gynecological disorder that causes dysmenorrhea to prevent it from getting worse. How are the pains of the rules explained? Moreover, the perception of contractions is very variable from one woman to another. Some will feel their stomach a little more sensitive, others will be very painful. 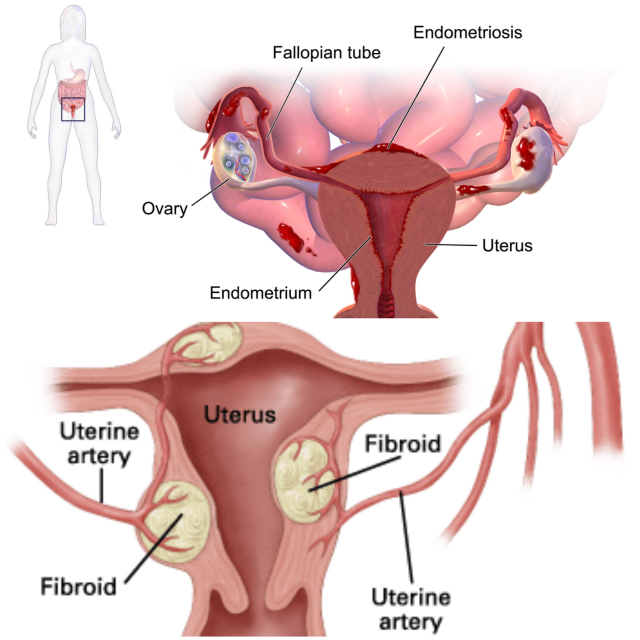 Usually, the pains are more important at times when the menses are abundant because the uterus has to contract more intensely to evacuate the endometrium. The symptoms of dysmenorrhea last from 2 to 3 days, on average. Live in difficult social or psychological conditions. Wear an intrauterine device (IUD) to copper. In contrast, the Mirena, a progestogen-containing device, can significantly reduce menstrual pain (see Medical Treatments ). Eliminate red meats , which have a high content of arachidonic acid (a fatty acid at the source of pro-inflammatory prostaglandins). A study conducted in 2000 with 33 women suggests that a vegetarian diet low in fat is effective in reducing the intensity and duration of dysmenorrhea. Check with the help of a nutritionist the presence of a deficiency of vitamin C, vitamin B6 or magnesium. These micronutrients would be essential for the metabolism of prostaglandins and their deficiency would cause inflammation. Avoid drinking coffee when pain is present. Instead of releasing fatigue and stress, coffee will increase the pain because its effects on the body are similar to those of stress. The chronic stress would be equally harmful to the body that an unbalanced diet. Indeed, the stress hormones (adrenaline and cortisol) cause the production of pro-inflammatory prostaglandins. The Mayo Clinic suggests to women who experience painful menstruationevery month to incorporate practices such as massage, yoga or meditation into their lifestyle 7 . You also need to understand where the stress comes from and find strategies to better manage it. See also our file Stress and anxiety. Some experts, including the D re Christiane Northrup (author of the book The Wisdom of Menopause ), say that a diet rich in omega-3 helps reduce menstrual pain due to their anti-inflammatory . More specifically, the anti-inflammatory effect comes from substances produced by the tissues from omega-3 ingested, for example from certain prostaglandins (see explanatory diagram at the beginning of the Omega-3 and omega-6 form). This type of diet would also reduce uterine contractions and therefore the pain they can cause. Prostaglandins have very varied and powerful effects. There are twenty types. Some, for example, stimulate uterine contractions (see box above “How do menstrual pain explain?”). Those with anti-inflammatory activity are mainly derived from omega-3s (fish oils, seeds and linseed oil, nuts, etc.). Prostaglandins, which in excess may have a pro-inflammatory effect, are rather derived from omega-6 contained in animal fat. This is entirely in line with the proposal of other experts to return to a diet that provides an adequate ratio of omega-6 and omega-3 to reduce the incidence of inflammatory diseases and improve cardiovascular health 1-3 . Indeed, it is generally estimated that the ratio omega-6 / omega-3 in the western diet is between 10 and 30 to 1, while it should ideally be between 1 and 4 to 1. Nonsteroidal anti-inflammatory drugs. Menstrual pain is usually relieved by the use of nonsteroidal anti-inflammatory drugs (NSAIDs), the effect of which is to hinder the formation of pro-inflammatory prostaglandins. Ibuprofen (Advil, Motrin) is available over-the-counter. Another type of NSAID may be prescribed by the doctor if ibuprofen is not suitable, such as naproxen (Anaprox, Naprosyn) or mefenamic acid (Apo-mefenamic, Ponstan). They are used as soon as the symptoms appear, for 2 or 3 days. They relieve pain caused by uterine contractions as well as headaches, nausea and diarrhea. Nonsteroidal anti-inflammatory drugs can cause side effects, the most common of which are heartburn, diarrhea, abdominal pain and headaches. Although NSAIDs are generally effective, 20% to 25% of women are not relieved by these drugs. Oral contraceptives. Symptoms can also be alleviated by taking an oral contraceptive, which prevents ovulation, reduces prostaglandin production and reduces menstrual flow. This method is generally effective in reducing not only the duration and abundance of menstruation but also the pain that accompanies it. Some people also choose to stop menstruating by taking the birth control pill continuously, which solves the pain problem indirectly or by switching to Depo-Provera (an injectable contraceptive that causes amenorrhea). It is also possible to take contraception containing a progestin alone, continuously. In general, menstrual periods are much less abundant and sometimes stop during treatment, which solves the problem of pain. The menstruation resumes at the end of the treatment. Contraceptive by injection. Depo-Provera (a contraceptive administered by injection that causes amenorrhea) is also available but it is not devoid of adverse effects: irregular bleeding, weight gain, decreased libido. In addition, these effects cannot be stopped once the substance is administered and one must wait until the end of the efficacy (4 months) to return to normal. Intrauterine device (IUD ). Another option is to wear the Mirena IUD. It is an intrauterine device containing a progestin. It fits into the uterus. In addition to being contraceptive, it significantly reduces menstruation and pain. It only needs to be changed every 5 years. In case of dysmenorrhea caused by a gynecological disorder, the doctor will treat the condition causing the pain. Rest and avoid stressful situations when menstruation is approaching.